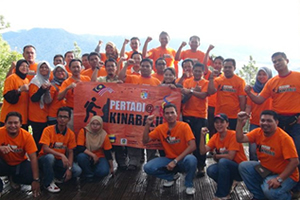 KOTA KINABALU, 30 July 2012 – July 11 will be long remembered by 20 administrative officers of The National University of Malaysia for successfully reaching the summit of Mount Kinabalu, the highest mountain in Southeast Asia. We were part of the 30 strong members of the Association of Administrative and Professional Officers of UKM (PERTADI) including eight female officers led by its President, Azli Mohd Kasirun who undertook the challenge earlier this month. The programme is to test the physical endurance and well being as well as team spirit of participants in cooperating and helping one another to climb the 4905.2 m mountain. 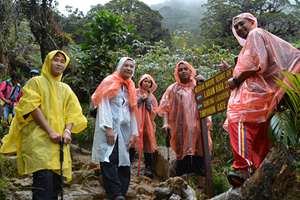 The journey began at Mesilau Resort from Layang-layang checkpoint (Km5) to climb up the uneven terrain to Laban Rata at Km6 in chilly drizzling rain. At the Laban Rata rest area, all the istonic drinks and mineral water brought by participants had long gone. It was fortunate that at a number of halt areas, there were springs where water could be collected to quench our thirst. Chocolates and energy bars were also in great demand. 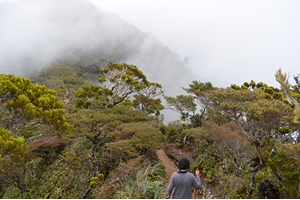 Though a few participants suffered from temporary cramps due to fatique and the chilly weather, they continued with the journey not wanting to disappoint their collegues and reached Laban Rata at 5pm. All were seen dead beat after the climb but could still welcome with claps and shouts at the stragglers. 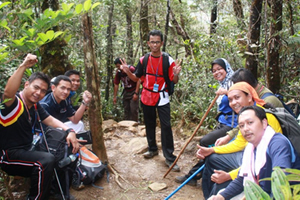 At Laban Rata we were divided into two groups with one billetted at Gunting Lagadan as Laban Rata could not accomodate us all. We continued with the journey that night after an early breakfast at 2.30 am with a final briefing before proceeding with the last leg of the climb of 2.85km. Though all of us were covered head to toe with appropriate warm clothing we still felt chilled to the bones due to the drizzle and fog. It was indeed a challenge to climb the final 2.85 km to the top in such conditions and having to go over slippery rocks and fissures by clinging to the guide ropes. We were greatly impressed by the prowess of porters paid to carry some of the goods of the climbers. We reported to the guide at Sayat-sayat Pondok (Km7) showing our name tags and continued even though some had already felt fatigue and shiverring in the cold and damp atmosphere. The fog and drizzle prevented us from enjoying the scenery. We could only see our headlamps. As we near the summit, we began to see the sun’s rays and this lifted our spirits to proceed and reached the summit at 7.02 am when we unfurled the PERTADI UKM flag. Names of all who reached the summit were then registered by the guide. The weather turned for the better at the summit with the sun now shining and we could see that the summit is quite a big area. It was only then that we realised the expanse of ground that we had covered to reach the top. We spent more than one hour at the top taking photographs, having breakfast and enjoying the scenery. 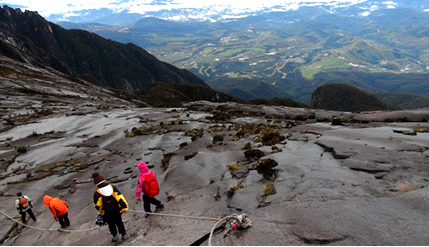 It was then time to pack up to get down back to Laban Rata and on to the Kinabalu Parks Hq via Timpohon, a distance of 6km.